Collectors flock to Toronto in the fall and spring for the Sports Cards & Collectibles Expo. We have already shared some of the details on what we have planned for the show in Toronto on May 5, 6 and 7 for the show. If you were planning on taking advantage of the redemption program, we encourage you to reach out to us as soon as possible as the window is closing there. 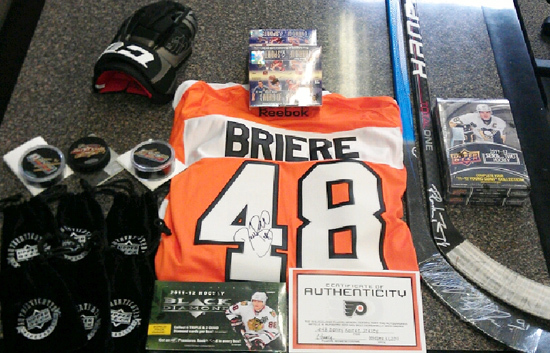 Of note, we can assist with fulfilling the 2011-12 NHL Artifacts redemptions (both signed and unsigned) with that program so you can pick them up at the show. The Priority Signings wrapper redemption program will return where fans in attendance who purchase a box of 2011 NHL Parkhurst Champions, 2011-12 NHL Black Diamond, 2011-12 NHL Upper Deck Series Two or 2011-12 NHL SP Game-Used from a Certified Diamond Dealer at the show will receive a voucher. They can bring that voucher to the Upper Deck booth at specified times where they can exchange it, along with the wrappers from the box for a random 2012 NHL Priority Signings autograph card for FREE! As an additional bonus, case-breakers will not have to wait in any line. They can bring the product by to open when we are NOT running the box redemption program for immediate service. Case product MUST be purchased from an Upper Deck Certified Diamond Dealer at the show to participate in this program. Collectors are limited to open just one case per person. This promotion will be available while supplies last. A program like this will have quite a few benefits for all of our collectors at the Expo. First we will be able to assist case-breakers who are only in town for a day or two and may not be able to wait in the line with a great thank you for their support. For the regular box breaker, this will also help to reduce the line making fulfillment of Priority Signings cards much quicker. We have some additional plans to help make the fulfillment process quicker and easier for box breakers that we will share at the show. 2018-19 Game Dated Moments Week 20 Cards are Now Available on Upper Deck e-Pack®! Wow, I wish I could make it to the Expo. I want some of those items. 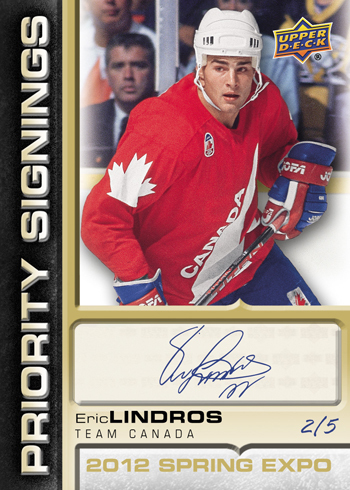 That Lindros card looks nice and that hockey stick would look good in my sports room at home!